Today is National Apple Strudel Day (more on that later), so I’m making an Austrian themed dinner. When I was a little girl and Mum used to say ‘what do you want for your birthday tea?’ I’d always choose schnitzel. I love it. So do the Austrians. By law in Austria, Weiner Schnitzel has to be made from veal, if it’s pork or chicken they have to say so. I have recently discovered panko breadcrumbs which make schnitzel taste oh so good. It’s worth the extra cost to use them (even if they are Japanese and not strictly authentic). 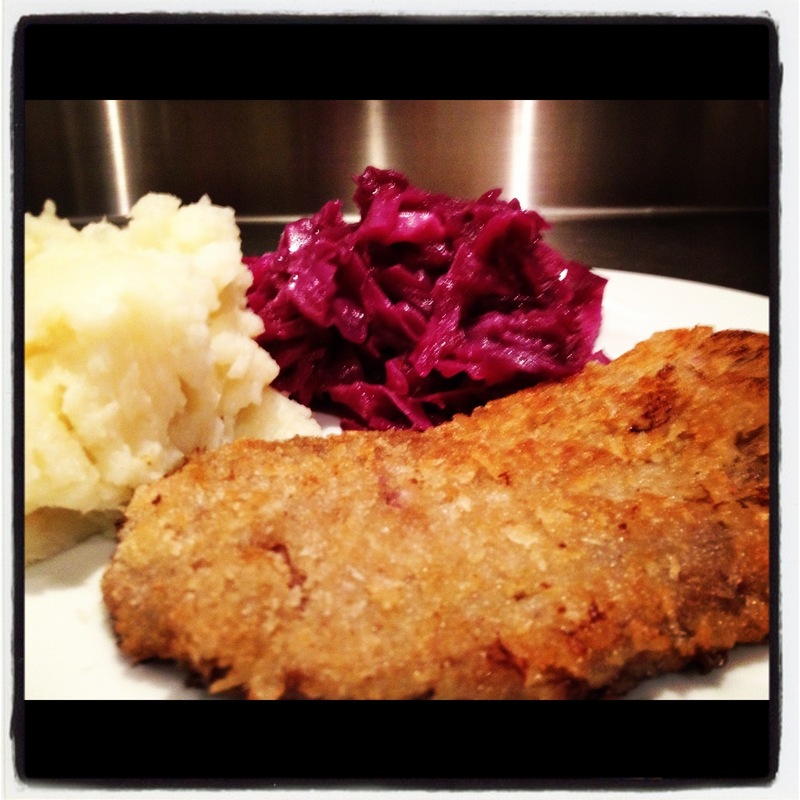 Red cabbage with apple goes perfectly with schnitzel, and this recipe is super easy to make. Dip the schnitzel meat into flour, then a beaten egg seasoned with salt and pepper, finally into breadcrumbs. Pan fry on both sides until golden. 3 Tbsp white wine vinegar. 1. Heat oil in large saucepan. Stir cabbage and onion until wilted. Add apple, water, salt and pepper. Cover and simmer for around 25 minutes. 2. Combine sugar and vinegar and add to the cabbage. Cook for a further 5 minutes. The cabbage can be made in advance and reheated.